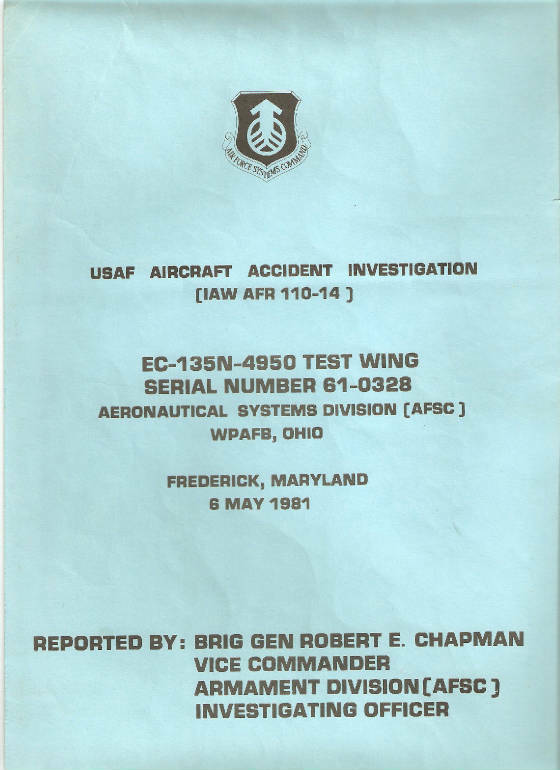 This is a verbatim transcript of General Chapman's USAF summary report on the mysterious crash of the EC-135N on 6 May 1981. The report is on legal size paper and not easily scanned; so, with the exceptions of the cover page and, at the end, a diagram and map, the text was copied word for word. Certain passages which the author wishes to highlight are in italics and in red. When one reads about the lack of any distress call, the anomalous transponder beacon signals immediately before an unexplained move to the full nose down attitude, the total loss of electrical power and an unexplained explosion inside the pressurized compartment of the fuselage near the very end, one wonders why this "accident" investigation wasn't turned over to the proper authorities for criminal investigation. For more on the political considerations surrounding this event, and an emerging pattern of cybernetic telecommunications piracy subsequent to it, please see http://www.show-the-house.com/id9.html. On 6 May 1981, EC-135N, Serial Number 61-0328, call sign AGAR 23, departed Wright Patterson AFB, Ohio, at 1005 Eastern Daylight Savings Time (EDT) on a routine training mission. On board the aircraft were 17 crewmembers and four authorized passengers. The flight proceeded uneventfully as planned for approximately 45 minutes. Then in a few brief moments, a sequence of very rapid events resulted in a crash with the loss of all onboard. At 1049:48 EDT, The Federal Aviation Administration (FAA) lost radar contact with AGAR 23. The aircraft was cruising at Flight Level 290, at .78 Mach while performing a navigational training leg. The aircraft commander, Capt Emilio, occupied the right pilot seat and a passenger, Mrs. Emilio, occupied the left pilot seat. Also in the crew compartment were the 2 navigators, Lt Col Frederick and Capt Fonke, and 2 passengers, Mrs. Fonke and SSgt Brundige. For undetermined reasons, the aircraft pitch trim moved to the full nose-down position. The aircraft then a rapidly pitched over, most likely upon release of the auto-pilot, and induced sufficient negative "G" forces to cause the generators to trip off line, resulting in the loss of all AC electrical power. The pitch trim could not then be moved electrically. This condition, while unusual, can be controlled if prompt corrective action is taken; however, if corrective action is delayed approximately 8 seconds, the aircraft pitch angle will be greater than 30 degrees nose-down in the airspeed in excess of 350 knots indicated airspeed. Under these conditions, the aircraft cannot be controlled until the pitch trim is moved toward neutral. While it is evident that recovery was delayed, the reason for the delay is unknown. The aircraft became uncontrollable and entered a steep descent. During the rapid descent, an explosion occurred at approximately 1300 feet above ground level followed immediately by catastrophic failure, and complete break-up of the aircraft. TABs 1, 2, and 3 of this report provide a summary of the accident and can stand alone as a complete document. The remaining TABs provide more detailed information and supporting documentation. 1.1. FLIGHT PLAN. EC-135N aircraft, S/N 61-0328, call sign AGAR 23, was scheduled for an Advanced Range Instrumented Aircraft (ARIA) training mission on 6 May 1981, with a planned departure time of 1000 Eastern Daylight Savings Time. Departure point and destination was Wright-Patterson AFB, Ohio. The mission was designed to provide training for the navigator and primary mission electronic equipment (PMEE) operators. The route of flight was planned eastbound to a point near Sea Isle, New Jersey VORTAC, then westbound to Charleston, West Virginia VORTAC. This portion of the mission was scheduled for approximately 2 hours to allow for a navigation leg and calibration time for the PMEE operators. At this point, the plan was to delay in the Charleston, West Virginia area to practice timing orbits and to gather telemetry data with a recovery at Wright-Patterson AFB, Ohio. Total mission duration was planned for approximately 5 hours. 1.2. CONDITION OF AIRCRAFT. A detailed analysis of aircraft maintenance records revealed no uncorrected maintenance discrepancies or history of problems that would have caused this accident. Critical components of the fuel, auto-pilot, and flight control systems that were not destroyed in the crash were analyzed, and no anomalies were found. Programmed depot maintenance was performed on EC-135N, S/N 61-0328, at the Oklahoma City Air Logistics Center during the fall of 1980, and returned to the 4950th Test Wing on 26 November 1980. During the period from December 1980 to 6 May 1981, the aircraft flew 6 missions totaling 19.1 flying hours. During this same period, the Class II primary mission electronic equipment associated with the telemetry mission was reinstalled on the aircraft. This equipment was previously removed to facilitate the programmed depot maintenance. In addition, a periodic phase inspection was performed on the aircraft during 14 days in April 1981. The aircraft maintenance forms reflect only routine discrepancies in each of the 6 missions. On both of the last 2 missions prior to 6 May 1981, the aircrews were sufficiently impressed with the condition of the aircraft to to complementary remarks on the aircraft forms. The 10 April 1981 entry reflected, "O.K. flight. Good flying and good looking aircraft." The 28 April 1981 entry reflected, "Aircraft very clean, crew chief should be commended for a job well done." Discussions with the 4950th Test Wing Operations and Maintenance personnel indicated that this aircraft was considered one of their most reliable and best flying aircraft. A review of historical safety records did not indicate any reported incidents or problems with fuel, auto-pilot, or flight control systems. All available information reflects a reliable aircraft which had compiled an excellent mission and safety record. The aircraft commander, Capt Joseph Emilio, An Instructor Pilot, had been assigned to the 4951st Test Squadron since January 1979. He had a total of 2900 hours of which 2500 were in various types of C-135 aircraft. All required evaluations were completed in a highly qualified manner. Capt Thomas E. Bayliss, a pilot, was qualified in the C-135, currently in the ARIA training program, with a total of 1700 hours. Capt Walter T. Lusk was a test pilot qualified as Instructor Pilot in the UH-1 helicopter and copilot in the C-135. He was currently flying as copilot for 6 months to gain experience in the C-135 aircraft. The aircraft had 2 navigators onboard. Capt Donald V. Fonke was in the ARIA training program. He was current in the C-135 aircraft, having previously been an instructor in the KC-135Q while in Strategic Air Command. He was receiving training under the supervision of Lt Col Benjamin B. Frederick, who was a navigator flight evaluator. Lt Col Frederick had a total of 15 years flying experience, most of which was in KC, EC, C-135 aircraft. He had flown the ARIA aircraft since 1977. The remaining 12 crewmembers onboard the aircraft were PMEE operators or flight engineers and were not directly participating in the operation of the aircraft. 1.4. PASSENGER FLIGHT AUTHORIZATION. EC-135 aircraft, S/N 61-0328, had 4 passengers on board during the mission. Two passengers were wives of crewmembers participating in the HAVE PARTNER Program (TAB 4.1.). One passenger, SSgt Joseph T. Brundige, Jr., was an Administrative NCO assigned to the Wing. He was onboard as an official observer for an orientation and motivation flight. The fourth passenger, Michael W. Reilly, was a Contract Engineering Technical Services representative For Bell and Howell Company. He was onboard the aircraft to complete an engineering evaluation of the recorder system recently installed by his company. All passengers were manifested in accordance with proper directives. 1.5. WEATHER CONDITIONS. Weather conditions at the time of the mishap for the flight level, surface to flight level, and weather at the impact site as follows. 1.5.1. Flight Level (29,000 feet): Clear, wings from 290 degrees at 30 knots, temperature -31 degrees F, no turbulence or icing. 1.5.2. Surface to Flight Level: The overcast was layered with tops to approximately 20,000 feet above mean sea level. There was a light rain, but no evidence of thunderstorm activity. The freezing level was between 10,000 and 11,000 feet above mean sea level. 1.5.3. Surface: The sky was overcast with a ceiling at approximately 2,000 feet above ground level. The visibility was restricted by light rain and fog to approximately 2 1/2 miles. The temperature was approximately 54 degrees F. Surface winds were from the southwest at approximately 3 knots. 1.6. AIRCRAFT COMMUNICATIONS. All communications between Washington Center and AGAR 23 were recorded up to the time the Identification Friend or Foe (IFF) beacon was lost by Center. This recording was furnished to the Accident Investigation Team and was reviewed by team members and voice experts. AGAR 23 was switched from the Martinsburg low sector controller to the Baltimore high sector controller. AGAR 23 checked in on the newly assigned VHF frequency at 1445:36z. These final transmissions from AGAR 23 were normal and indicated no stress or indication of any malfunctions. A female voice was detected on the recording 1:40 minutes after AGAR 23's last formal transmission. National Transportation Safety Board (NTSB) experts state that this transmission probably came from AGAR 23 (TAB 6.1.2.). No other radio transmissions were received from AGAR 23. At 1449:48z, the last IFF position was received, and the controller reported the IFF loss to AGAR 23 at 1450:58z with no reply. The controller continued the attempt to contact AGAR 23 on both the primary VHF frequency and guard channel with negative results. 1.7. RADAR POSITIONAL INFORMATION. Radar returns from the IFF beacon were received, processed, and displayed to controllers at the Leesburg, Virginia, facility. Until just prior to signal loss, all returns were normal and showed AGAR 23 to be level at flight level 290. Occasional returns were received indicating the aircraft was at flight level 289. This is normal operation indicating that the aircraft is climbing or descending slightly, but this is well within the tolerances of FAA requirements and the auto-pilot. Approximately 30 seconds prior to IFF signal loss, the Federal Aviation Administration (FAA) computer recorded 3 updates from AGAR 23 that included no altitude information. One of these updates also included an erroneous IFF beacon code indicating an invalid beacon signal was received from the aircraft. No reason could be found for the discrepancies. Two updates of AGAR 23's information were made by the computer prior to signal loss, and these were both normal. Aircraft altitude was indicated to be flight level 288 at that time. AGAR 23's ground track prior to signal loss was normal. 2.1. TIME SEQUENCE OF EVENTS. EC-135N aircraft, S/N 61-0328, departed Wright-Patterson Air Force Base, Ohio, at 1005 EDT and leveled off at 29,000 feet at 1030 EDT. At 1045 EDT, the pilot was directed to switch VHF radio frequencies and to contact Washington Center. The last aircraft voice transmission was made at 1045:36 EDT, a normal check-in with Washington Center on the new frequency. At 1049:48 EDT, The Identification Friend or Foe (IFF) transponder beacon return disappeared from radar at the Leesburg, Virginia, Federal Aviation Administration (FAA) facility. Voice contact could not be reestablished on the assigned frequency or guard channel. No distress calls or emergency IFF/Selective Identification Feature (SIF) replies were received by Washington Center. The aircraft crashed at approximately 1051 EDT. (TAB 4.2.). The estimated time of flight from beginning of descent to impact is 90 seconds +/- 30 seconds. 2.3. AIRCRAFT BREAK-UP. An explosion and catastrophic structural failure of the aircraft occurred in the air at an altitude below 2,000 feet pressure altitude (PA), after a rapid descent from an altitude of 29,000 feet. Evidence from detailed structural analysis suggests that after an explosion, internal to the pressurized fuselage compartment, the wings separated from the aircraft and that the fuselage and empennage separated into major sections prior to ground impact. Further break-up of these pieces of structure occurred while the act craft was still in the air. Other major aircraft components, such as the landing gear, also separated from the remaining aircraft structure prior to ground impact. Some equipment normally contained in the fuselage was thrown clear of attaching structure prior to ground impact. 2.4. AIRCRAFT IMPACT. 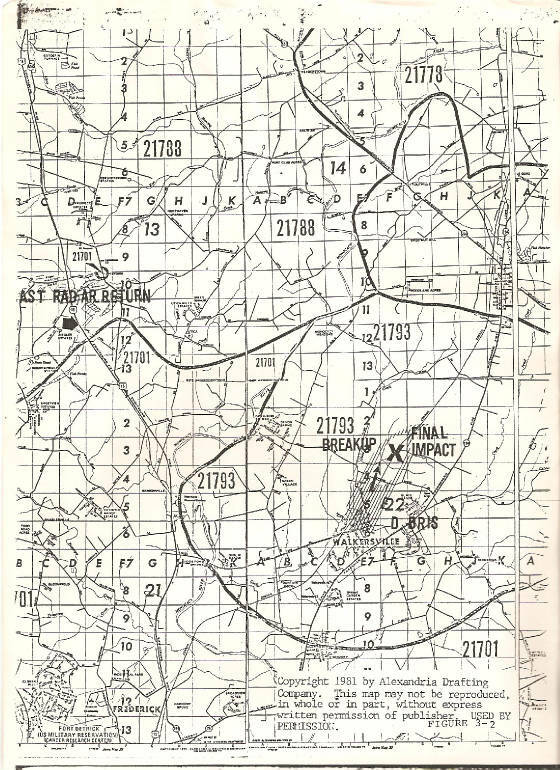 The impact of the major aircraft components occurred at a site 1.7 nautical miles NNE of the town of Walkersville, Maryland. The main impact area was approximately elliptical in shape and was 2,400 feet long by 1,800 feet wide. It was located 4.3 nautical miles ESE from the last reported radar position of the aircraft as established by the FAA. 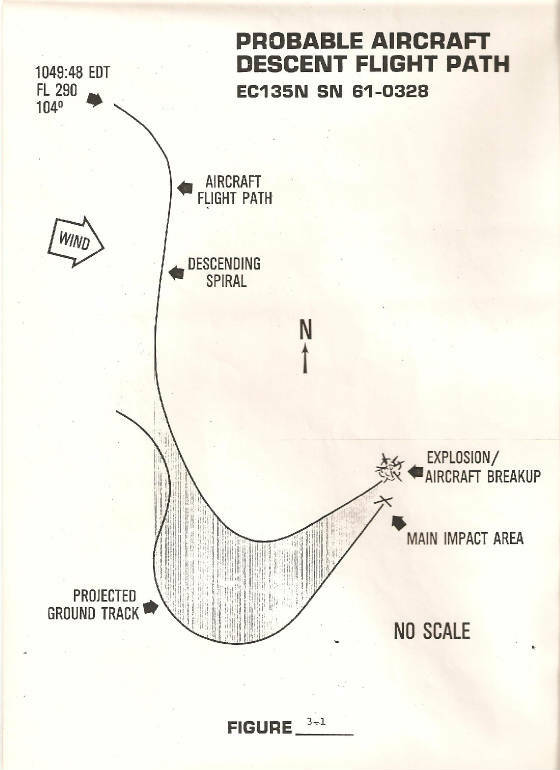 The pattern of the wreckage suggested that airborne separation of major aircraft components occurred prior to ground impact. All debris and components were found within 2 nautical miles of the impact site, except for small, light items, and paper products found outside that range. 2.5. AIRCRAFT WRECKAGE. The wreckage consisted of the major portions of the aircraft structure and subsystem components. These major portions were all found in a relatively small impact area. Portions of the wing, empennage, fuselage, landing gear, flight control surfaces, control rods, linkages, and control tab components were found at the site. A scenario as to the mode of the structural break-up was established. There was no evidence of sustained fire or explosion prior to departing 29,000 feet. Indications of an explosion at low altitude were found. The actuator which controls the stabilizer trim was also found at the crash site in a position which corresponded to the full aircraft nose-down position. Identifiable portions of the electronic equipment contained in the fuselage area were found in the vicinity of the accident. The immediate crash site contained most of the wreckage. (See Photographic Volume III.) Additional fragments, such as pieces of paper and insulation, were found in an elliptical pattern about 2 miles long and 1/2 mile wide. From the on-site investigation, location of the personnel found in the cockpit impact area was clearly established. Seating or standing locations of other personnel in the aircraft could not be established. The Accident Investigation Team partially reconstructed the wreckage in a hangar at Andrews AFB. The Accident Investigation Team was able to determine by inspection that an explosion occurred in the pressurized portion of the fuselage, followed by immediate structural break-up of the aircraft. After partial reconstruction of the wreckage, there was no evidence of inflight fire and all fire damage appeared to be post ground impact. 3.1. BACKGROUND DISCUSSION. In order to establish as much factual information as possible, the investigators considered many hypothetical causes of the accident. Each hypothesis developed was measured against the conditions of flight, actions of the aircrew, normal flight procedures, and the conditions of the aircraft wreckage. Obvious hypothetical causes included fire or explosion onboard the aircraft at altitude; loss of cabin pressurization by rapid decompression followed by an emergency descent; loss of windscreen or window in the crew compartment; and loss of all or part of the aircraft structure. Under analysis, there was little or no supporting evidence for any of these hypotheses. The one hypothesis that could not be disproved and which fits all conditions found during the investigation was full nose-down pitch trim resulting in aircraft pitch-over to a steep dive angle; a condition from which the aircraft could not be recovered. 3.2.1. Pitch Trim. Pitch trim was full nose-down as determined from the aircraft wreckage. (TAB 5., Part I, Safety Board Report, TABS J & S; also TAB 6.4.) The cockpit pitch trim indicator recovered from the aircraft wreckage indicated full nose-down trim (3.5 units nose-down). This indicator is a strong mechanical structure that should continue to indicate accurately after the force of impact. Additionally, the horizontal stabilizer trim jackscrew was recovered from the wreckage and indicated full nose-down trim. Since the jackscrew can be changed only by rotation of the screw, there is no possibility that the position of this jackscrew could have been altered by impact forces. The pitch trim is driven by an AC motor. Once AC electrical power is lost, the pitch trim cannot be electrically changed, but may be manually driven by the pitch trim wheel. This is a slow, laborious process which would require approximately 35 revolutions to return the trim from full nose-down to zero. Additionally, the stabilizer trim cut-out switch was found with the safety cover raised in the switch in the "cut-out" position; presumably activated by the pilot in an effort to stop the trim from driving to a more extreme position. 3.2.2. Loss of Electrical Power. All aircraft AC electrical power was lost at altitude. The loss of radar transponder return indicates that at the last altitude readout, this aircraft was at flight level 288 (TAB 4.2.). Certain aircraft instruments were recovered from the wreckage and were read during technical analysis (TAB 5., Part I, Safety Board Report, TAB J). Several of these instruments retain their last reading when AC power is lost. Instrument readings indicated conditions of flight that would be normal for cruise flight at altitude; for example, engine power settings (Engine Pressure Ratio of 2.3). Further, both TACAN distance measuring instruments (Distance Measuring Equipment (DMEs)) indicated 125 nautical miles, presumably from Sea Isle VORTAC. TACAN equipment can read distances of 125 nautical miles only at altitudes above 10,000 feet. This establishes conclusively that this last reading was at an altitude above 10,000. The aircraft AC electrical system is powered by 4 generators, 1 on each engine, driven by a constant speed drive from that engine. A characteristic of this system is that the generators will trip OFF under conditions of negative "G" forces. This may occur at "G" forces as high as .2 positive "G." Conditions of flight during an abrupt pitch-over maneuver, resulting in negative "G" sustained for more than 2 seconds, would result in loss of all AC electrical power. 3.2.4. Dive Angle. The aircraft dive angle was rather steep indicating an out-of-control condition during descent. It is unlikely the crew would descend below an altitude of 10,000 feet during an emergency descent; and in any event, they would not descend in cloud conditions below the level of the highest terrain in the area. The dive angle of the aircraft for a 90-second time of flight and aircraft speed of 400 Knots True Airspeed (KTAS) would be approximately 27 degrees nose-down. Variations in speed or time of flight could vary the calculated dive angle. Witnesses saw the aircraft emerge from the clouds at an altitude of approximately 2,000 feet and described the dive angle as 20 to 30 degrees nose-down. 3.2.5. Flight Simulator Results. The aerodynamics of flight were investigated using a flight simulator at the Flight Dynamics Laboratory, Wright-Patterson AFB, Ohio. (TAB 6.2.) The conditions of flight were established to correspond to normal cruise conditions at flight level 290 and cruise Mach of .78. Trim was moved to the full nose-down position in the simulator released. Based on these simulator in valuations, 2 determinations were made. 3.2.5.1. Recovery Initiated Immediately. When recovery was initiated immediately, the pilot experienced no difficulty in controlling the aircraft and reestablishing level flight conditions. 3.2.5.2. Recovery Delayed. When recovery was delayed beyond 8 seconds and until the aircraft was 30̊ nose-down with airspeed greater than 350 Knots Indicated Airspeed (KIAS), recovery was impossible. The nose of the aircraft could not be raised to level flight with full back control column even when engine power was retarded and speed brakes were deployed. The aircraft pitch would remain 30̊ to 40̊ nose-down until the end of the simulator run. The only factor that successfully restored control of the aircraft was the ability to retrim from the full nose-down setting. In the pitch-over maneuver induced in the simulator, all runs resulted in negative "G" conditions with -.3 "G" to -.6 "G" being the most common readings. 3.3. RESULTS OF ANALYSIS. On 6 May 1981, EC-135N, Serial Number 61-0328, call sign AGAR 23, departed Wright-Patterson AFB, Ohio, at 1005 EDT on a routine training mission. Onboard the aircraft were 17 crewmembers and 4 authorized passengers. The flight proceeded uneventfully along the planned route of flight for approximately 45 minutes. Then in a few brief moments, a sequence of very rapid events ended in a crash with the loss of all onboard. At 1049:48 EDT, FAA lost radar contact with the aircraft. The aircraft was cruising at flight level 290 at .78 Mach and was performing a navigational training leg. Navigational legs are normally flown on auto-pilot, and FAA altitude readouts showed the aircraft was within 100 feet of assigned altitude, characteristic of auto-pilot flight. The aircraft commander, Capt Joseph Emilio, occupied the right pilot seat and a passenger, Mrs. Peggy Emilio, occupied the left pilot seat. Also in the crew compartment were the 2 navigators, Lt Col Benjamin B. Frederick and Capt Donald V. Fonke, and 2 passengers, Mrs. Linda Fonke and SSgt Joseph T. Brundige. This phase of flight, the navigational leg, was the least demanding on the pilot and was the logical time for the passengers to come forward to view the cockpit area. There is no evidence that the presence of the passengers in the crew compartment contributed to, or caused, the accident. For undetermined reasons, the aircraft pitch trim moved to the full nose-down position. The auto-pilot can overcome the trim until near full nose-down. The aircraft then rapidly pitched over, most likely upon release of the auto-pilot, and induced sufficient negative "G" forces to cause the generators to trip off line and loss of all AC electrical power. The pitch trim could not then be moved electrically. This condition, while unusual, can be easily controlled if prompt corrective action is taken; however if corrective action is delayed approximately 8 seconds, the aircraft pitch angle will be greater than 30̊ nose-down in the airspeed in excess of 350 KIAS. Under these conditions, the aircraft cannot be controlled until the pitch trim is moved toward neutral. While it is clear that recovery was delayed, the reason for the delay is unknown. The aircraft became uncontrollable and entered a steep descent. The aircraft emerged from the clouds at 2,000 feet above ground level (AGL) and was intact. Airspeed was in excess of 400 KTAS and die to angle was 20 to 30 degrees. Engine power was above 2.0 engine pressure ratio (EPR). At approximately 1,500 feet mean sea level (MSL) an explosion occurred inside the pressurized compartment of the fuselage and weakened the aircraft structure to the extent that catastrophic failure of the aircraft followed immediately. Cause of this explosion is undetermined; however, the aircraft was in an unrecoverable condition at the time of the explosion and a crash was already inevitable.